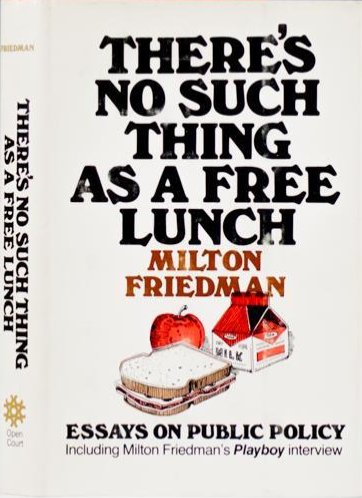 “There’s no such thing as a free lunch” – so said world renowned economist Milton Friedman who popularized the phraze by using it as the title of his 1975 book. The “free lunch” refers to the once-common tradition of saloons in the United States providing a “free” lunch to customers who had purchased at least one drink. Many foods on offer were high in salt (e.g. ham, cheese, and salted crackers), so those who ate them ended up buying a lot of beer. It was the beer that paid for the lunch. The same tactic seems to be in play with Oracle® Java®. Tempted by the promise of open software, programmers innocently develop applications they believe to be free – unbeknowingly including components that are not. After a six year haitus from the purchase of Java creator Sun Microsystems in 2010, and after the recently failed $8.8Bn lawsuit (in appeal) against Google, Oracle has created a dedicated ‘SWAT’ team of 20 Java specialists to go audit its customers. Times are hard and Java must pay its way. 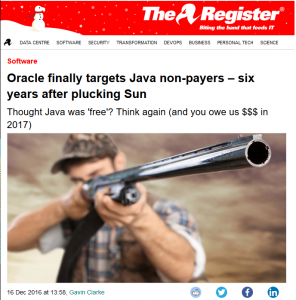 And the bill left by the auditors can sometimes be as salty as the ‘free lunch’ – 5 and 6 figure sums are being asked of customers that once lauded the ‘freedom’ of Java. Oracle denies this. They claim it is ‘business as usual’. Customers disagree. “… Huge sums of money are at stake, with customers on the hook for multiple tens and hundreds of thousands of dollars. The flavour of Java in contention is Java SE, which has three paid-for packages that range from $40 to $300 per named user and from $5,000 to $15,000 for a processor licence.